I've had for a while the crazy idea of trying to turn Kant's categorical imperative into a videogame. In one formulation, it says that you should "act only according to that maxim whereby you can at the same time will that it should become a universal law", so the game version would turn all your actions into universal laws: when you do something, it's now part of the game's rules. If it was prohibited before, it's now allowed, both for you and for other players. But, figuring out how to do that rule-induction in an interpretable way that illustrates a morality system is non-trivial (as I discuss in that essay). A more immediate step is to investigate the idea as a pure game mechanic, without the morality / world-simulation aspect. Take a simple game, perhaps something from the arcade or board-game genres, and add a new inductive-rules principle: when you do break a rule, a new rule is induced that makes your action legal. Then gameplay continues with the new rule as part of the game. Actually, to just get an idea for how this works as a game mechanic, let's try to bracket the rule-induction problem, which introduces some of the same complexity we had in the original categorical imperative game: when you want to induce a new rule to accomodate an action, in general an infinite number of new rules at various levels of granularity are possible. Let's try designing some simple games with very limited rule-breaking possibilities and fairly hard-coded rule-induction mechanics. 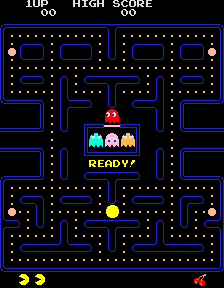 In the first experiment, take Pac-Man, and add one rule-breaking possibility: when you hold down a button, you can bulldoze your way through walls. Once you do so, the wall stays gone for the rest of the game, and the hole can be used by the enemy ghosts as well. What effect does this have? Knocking your way through walls can be useful in a pinch, to escape dead-ends. But doing it too much turns the maze into swiss cheese and makes it nearly impossible to actually avoid the ghosts. This actually appears to get at a little of our original goal, showing the possible negative consequences of rule-breaking. There's also a nice visual-representation aspect, where breaking the rules too much literally turns the maze into damaged-looking ruins of the original level. A second experiment, this time with a bit more rule-induction. Start with chess, but add the possibility to move pieces in a way that breaks the usual rules of chess. If you move a pawn in a way that would be illegal for a pawn, but would be legal for a bishop, henceforth all pawns, of both players, can move like bishops (in addition to still being able to move like pawns). More specifically, if a piece attempts to move somewhere that isn't legal for its type, we check if it would be legal for any other type, in the following order of preference: pawn, king, knight, bishop, rook (queen is never needed, since any move that a queen could make could've also been made by either a bishop or a rook). Then we add the induced type's movement ability's to the abilities of the offending type. What effects does this have? As stated here, it makes the games really short and very difficult to play. Contemplating the effects of a move in chess typically requires you to mentally project possibilities a few moves into the future. But now every move includes the possibility of a piece gaining new types of movement, so within a few moves into the future, pretty much anything is possible. It would be interesting to determine if there are dominant strategies in such a game. And perhaps, at a bit of a stretch, this outcome represents the view that rampant rule-breaking quickly degenerates into hedonistic chaos, where everyone can do anything, and order and structure disappears. But it's not a very fun game. One attempt at a fix: turn rule-breaking into a limited weapon that can be used some number of times a game, sort of analogous to the powerful bombs in some arcade games that you can use once or twice, but not all the time. This is still mentally more complex than regular chess, because projecting possible future moves and counter-moves requires you to consider the possibility that a piece will break the rules and gain new abilities at any time. But at least you can think of that as the opponent deploying their rule-breaking special move, which can only happen a limited number of times. Actually, to make it manageable, the limit in my experiments has mostly been set at one: each player can break movement rules, thereby inducing new abilities onto a type of piece, exactly once per game. I'm not sure how successful this is as a game still, but it's an interesting dynamic I'd like to investigate further. You can play reflexive-chess below, in the version that's limited to one rule-breaking move per player per game (Java required, and requires two players; no AI player yet). To make it a bit easier to remember what's going on, mousing over a piece will shade the squares that it can move to, based on the rules that have been induced so far for that type of piece. The Processing source code to this demo is here. If you want to try out additional variants, feel free to use and modify the code however you want. Published version: Mark J. Nelson (2012). Prototyping Kant-inspired reflexive game mechanics. In Proceedings of the 2012 FDG Workshop on Research Prototyping in Games. It's worth emphasizing (as the published version elaborates) that these experiments were only loosely inspired by the original Kantian-ethics game idea. In fact the resulting effect is strangely almost opposite from the purpose of Kant's thought experiment: the goal in this version of the reflexive mechanic is to break the rules in a maximally advantageous way, such that you gain an advantage despite the fact that your rule-breaking will henceforth become the new rules. Mirjam Palosaari Eladhari has a great two-part writeup (one, two) of the workshop at which this was presented, including a summary of my talk, and thoughts from her and others on how this work might be extended towards modeling non-utilitarian ethics in games in a meaningful way.